Each week we’re infusing flavor-enhancing ingredients (like fruit, coffee beans, spices, tootsie rolls, whatever else) into one of the beers we have on tap — and you help decide what those ingredients will be. Every week we take nominations, and then we do a poll to determine the winner. To learn more on how to submit an idea or vote, visit brewrepublic.beer/events/categories/randall-night/. Then get to the taproom each Wednesday to drink the winner! 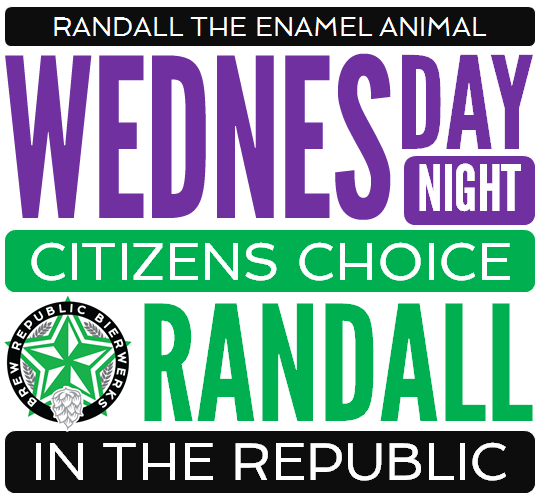 The top choice each week will be featured in our taproom on Wednesdays and the citizen submitting the winning idea will get a sample of the beer they concocted.